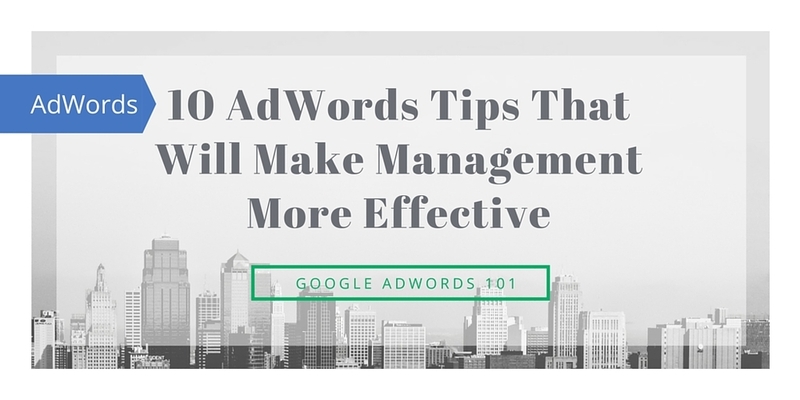 Managing AdWords accounts isn’t easy and it requires to run several analysis and reports before taking any sort of strategic decisions. Let’s have a look at 10 tips that will help you maximize the use of your time and money. Most times, you will need to use filters to get access to a specific data set. For instance, Let’s imagine that you are selling t-shirts and have different colors, it makes sense to call your adgroups “shirts – red – brand 1”, “shirts – black – brand 1”, “shirts – yellow – brand 1”, “shirts – red – brand 2”, “shirts – black – brand 2”, “shirts – yellow – brand 3” and so on. Thanks to a standardized methodology in naming the ad groups, you will be able to filter by color or brand and easily get access to the only the portion of data you really need. Users visit a site an average of six to eight times before making a purchase. Remarketing is great because it allows you to speed up the conversion funnel while establishing your brand as top of mind for the consumer. It is a best practice to create sub remarketing lists so you can customize ads and landing pages based on the content that visitors have actually visualized on your site. Negative keywords are extremely important to be able to allocate the budget only on terms that are actually likely to generate good performance for your site. You should update your negative keyword list every time you run a search term report, which should be analyzed twice a week. It is also important to set up a long negative keyword list right from the batch so your campaign can start with the right foot. DKI is used to customize a part of the ad based on the keyword that made an ad show up. The goal of DKI is to boost the effectiveness of the ads by making them more relevant to the users and therefore getting more clicks and a higher CTR. Higher CTRs usually lead to a higher quality score and therefore to an overall better ad position without the need to increase the bid. It is much better to break down geographic targeting by state rather than targeting the whole country. The reason is due to the fact that you can apply bid modifiers to target locations and therefore the more you break down your location targeting the more you can customize bids based on performance. In the example above, North Carolina, Ohio and Massachusetts clearly need to decrease their bids because they are performing at a high CPA. If you wouldn’t be targeting them separately, you wouldn’t be able to apply bid modifiers. This is a good technique to create a highly customized strategy for top performer terms in the account. You will be able to customize ads, bids and extensions with the goal to get as much traffic as possible from your best keywords. At the same time, make sure to create a negative keyword for your exact match top performers so you can exclude it from the other ad groups in the account. Google AdWords has a remarketing tag that can be easily installed and used. 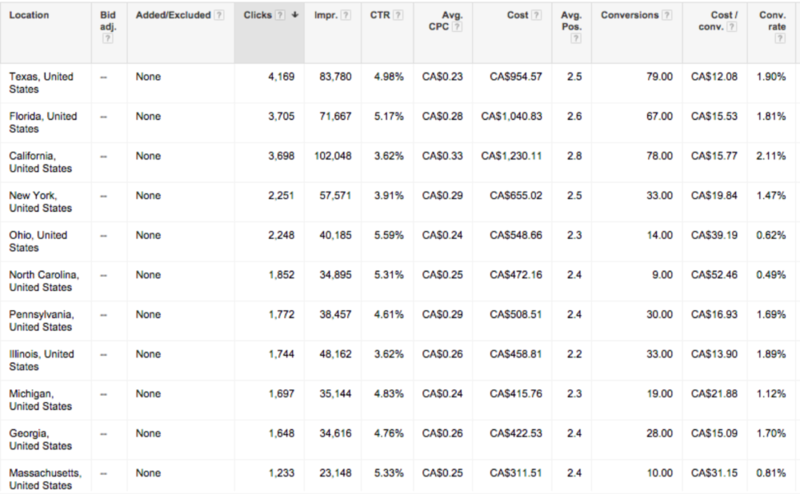 However, this remarketing tag is not as good as importing data from Google Analytics. With Google Analytics you can import lists based on website behaviors, such as time on site, page per views and number of transactions. This is very powerful and help businesses to create ads that are highly customized to the users and to not advertise to users that didn’t seem to show interest in your site. Landing pages are the key to lowering the conversion cost of a paid campaign. It is a best practice to always split test two variations of a landing page with the goal to constantly increase performance. You can use Google analytics or some other third party tool to automate, simplify and calculate there results of your tests. Instead of just running a regular remarketing campaign, start advertising to your website visitors when they are on Facebook and Twitter. This will increase results but also boost your brand value. This is most times overlooked but it can definitively help you optimize performance. The google search and partner network perform differently and you should break down performance by network to make sure results are heading in the right direction.